Residential Roofing Nashville: Is Poor Attic Ventilation Causing Problems? Many people don’t realize that their houses breathe, but they do. Specifically, the roof breathes. It takes air in and releases it and if this cycle is interrupted, problems can occur. 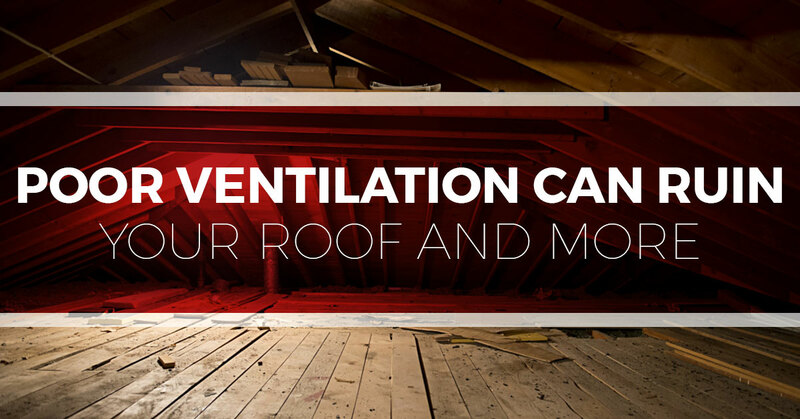 In this week’s article, we’ll cover how your home, and roof can suffer if the ventilation of your attic isn’t working as it should. We are Tim Leeper Roofing and serve the Nashville area. We offer both residential and commercial roofing services. In a roof that is properly ventilated, fresh air enters the attic space through the eave or soffit intake vents. Air is released through a vent or vents that are placed at the top of the peak of the roof, as well as under the gables. These vents allow air that is warmed, and so rises to the top of the slope to escape the attic space. From the outside, these vents look like small boxes or chef hats that rotate as the air passes through them, and these are called Whirlybird vents. A ridge vent looks like a raised area of shingles at the top of the peak of the roof. Inside the attic, you will discover that the insulation will be on the floor of the attic, keeping you from paying for the heating and cooling of this often unused space. Poor ventilation can cause lots of problems but what causes poor ventilation needs to be understood to help avoid it. One main cause is faulty or clogged soffit intake vents. These vents are found under the eaves of your home and they can become clogged. One of the main culprits is insulation in the attic. The air vent needs adequate room to allow air into the attic and frequently insulation installation covers them up. A baffle needs to be installed over the vent to keep insulation off of it, but these are often undersized or filled up by sloppy insulation installers. Another cause of poor ventilation in inadequate exhaust ventilation. If the upper surface of the roof has too few vents or they are clogged with debris, the air can’t get out and doesn’t circulate properly. There are two main categories of problems that occur from poor ventilation. One category involves the temperature of the attic. During the summer, the temperatures can rise to very high levels. You might think that as long as you are not spending time in your attic, what does it matter if the temperature is 150 degrees? These extreme temperatures can damage the shingles on the roof and shorten their life. The attic acts like a heavy, warm blanket on top of the living space of your house and when you turn on the air conditioner, it will have to work extra hard to cool off your home. In the winter time, the opposite problem happens. The attic will be colder than the outdoors and so your heater will have to work harder to warm your home. Another category of problems that poor ventilation causes is structural damage to your home. This happens because in the summer, on humid days, the attic will also become very humid when the temperature goes down at night. When the dew point is reached, the moisture will condense out of the air and clings to the inside of the attic. The insulation, the nails, your possessions in storage, and the underdecking of the roof can all be subject to moisture that, over time, undermines the integrity of the structure. When your nails rust, the whole roof is endangered. When your insulation gets damp, it doesn’t work well and so your heating and cooling bills will rise. You’ll also be overworking your heating and cooling unit and this can shorten the life of your heat pump or furnace. The likelihood of ice dams also increases with poor attic ventilation. This is because warm air in the attic melts the surface layer of ice or snow and then it drips down to the eaves and refreezes. This melting/freezing cycle can allow water and ice to creep into the nooks and crannies of the roof and can damage it. Here at Tim Leeper Roofing, we pay attention to ventilation issues. When we repair or replace a residential or commercial roof, we will check if the ventilation is functioning properly. We can check the baffle and both the intake and exhaust. If you are suspicious that there is a problem with the ventilation, give us a call and we’ll come out and do an inspection. We understand the value of a good roof and we want you to enjoy the benefits of your roof for as long as possible. Call us today if you have any problems.